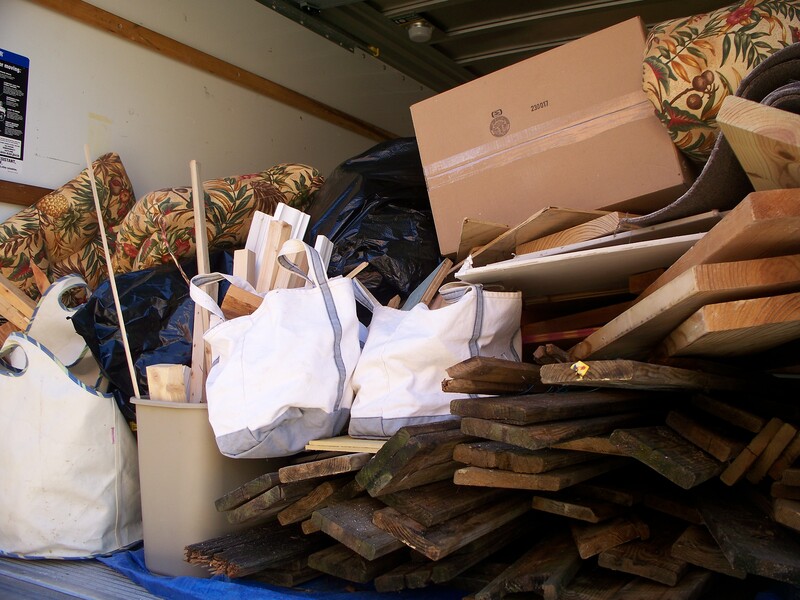 Earlier you may have read Bill’s post about coming to the conclusion that we were going to need more than a trash can to get rid of years’ worth of accumulations. This morning we rented a 15-foot truck to haul things away. Yep, we’re still in the purging process although what went into this 10’ X 15’ foot metal box on wheels was never destined to make it to France in the first place. In addition to the cost of renting a truck and driving it to the municipal landfill (aka county dump), we had to pay 38 dollars for leaving just over a ton of mostly leftover construction materials behind. This was the first time that either of us had been to the landfill and we’re both hoping that we won’t have a need to return. It was pretty gross and unnerving making us definitely glad that we were not in our own car. The roads were mostly mud-filled ruts made by these giant vehicles that move dirt, push garbage, and intimidate everything around them except for the vultures that can’t seem to be bothered to move unless something tasty is uncovered. While I anticipated a paved concrete drop off area, we were instead directed to join all the other giant garbage trucks, mired in mud, who were dumping their loads while trying to avoid the even larger earthmoving bulldozers towering above all of us. Although it took us a couple of hours to put that ton of material into the truck, we managed to throw all of it out the open bay door in about 15 minutes and get the heck out of there. I’d say that we were motivated. When we first moved into this house nearly 14 years ago the basement was approximately 1800 square feet of unfinished space. Not too long after our arrival we began the construction process which naturally necessitated countless trips to the DIY store. After completing the British pub, theater, wine cellar, gym, bathroom, and walk-in closet, what remained was a wealth of odd sized lumber, partial sheets of wallboard, bits of insulation, partially full paint cans, mixtures of screws, etc. Bill did drop off a few unopened items at the Habitat for Humanity Restore, but because of the weird sizes of lumber it wouldn’t have been useful to anyone else; hence, the need for the truck. I know that we’d set ourselves a 1-ton limit, which we exceeded, but having the basement cleared of debris feels really good. Here you can see the truck carefully jammed full, ready to be hauled away. Packing our suitcases is definitely going to be easier than this! Posted on January 20, 2016, in Before leaving the US and tagged Americans in Carcassonne, Downsizing, Move to France. Bookmark the permalink. Comments Off on Tons o’ fun.